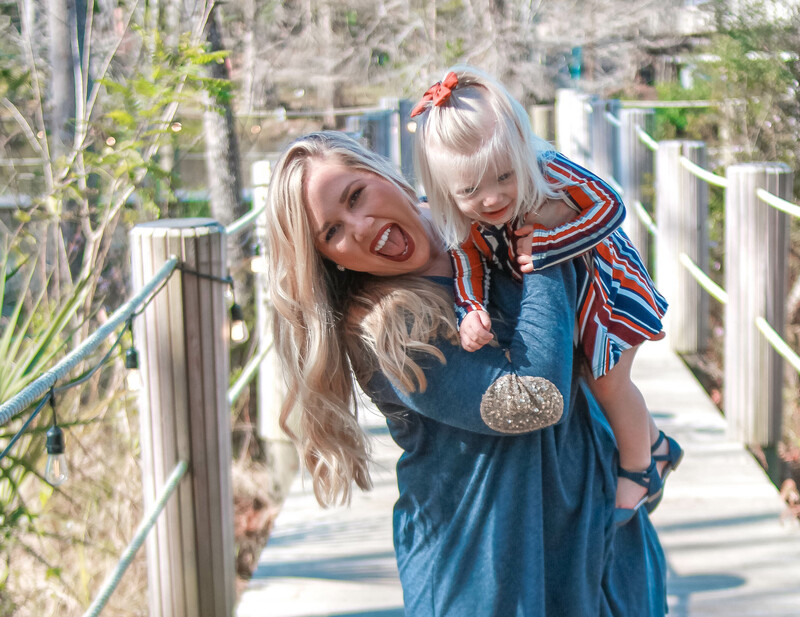 Mom + Me Dresses | What We Wore for Daisy’s Birthday! 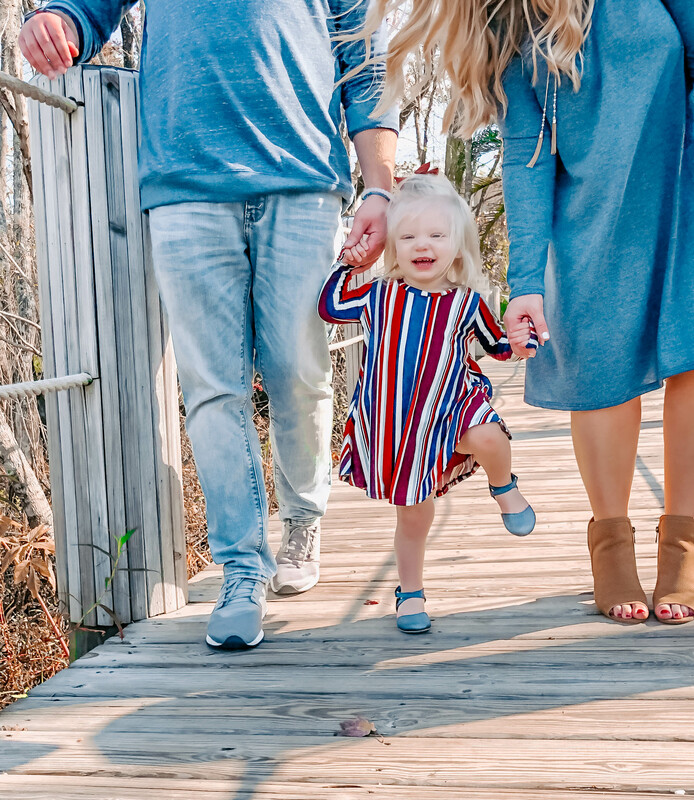 I have one very important question: how the heck is my baby girl already TWO?! Time really does fly by when you become a parent, that’s for sure. Thank goodness for this blog of mine so I can document everything and come back to reference it any time I want. Whew! So yeah, my little Daisy girl turned two this past Sunday, January 13th, and we celebrated with a little brunch party at a nearby brewery (sounds crazy, but it was awesome and a blog post on that is on its way!) with some of our closest friends. It was the perfect afternoon to celebrate our perfect baby girl! I’ll have more on the birthday celebrations coming later this week, but for now I wanted to share with you both of our party dresses! Any time I need something to wear for a special occasion, PinkBlush is always the first place I turn. Y’all have heard me talk about them many times … I always wear their clothes. And now so does Daisy (they carry baby and kids clothes now, yay)! They just have the best clothes for any occasion – from casual and sleepwear to formal and wedding-wear – all at affordable prices, and unlike everything else you find in stores. 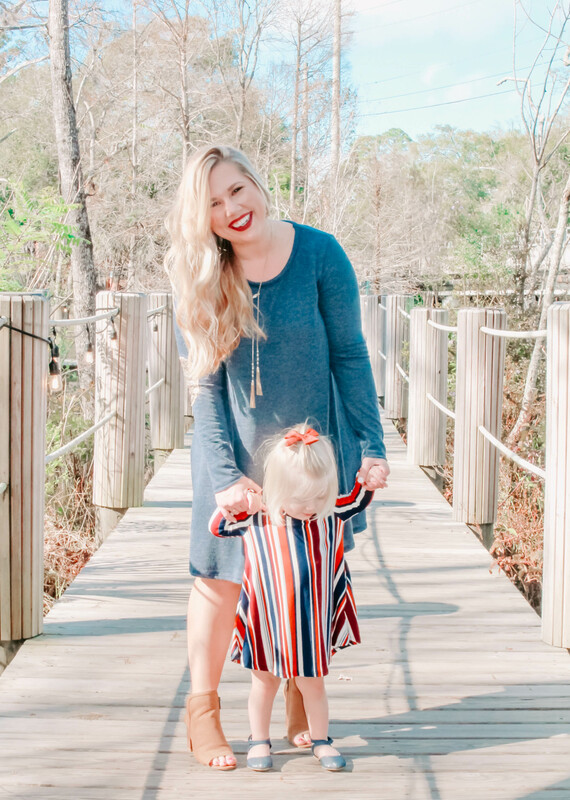 They started out as my go-to for maternity clothes, then quickly became one of my favorite places to shop for women’s clothing, and now baby/toddler clothing as well! My sweater dress is so easy to dress up or down, and I just love the sequin elbow patches! It would also be super cute styled with tall boots (or in my case, flip flops once I started chasing Daisy through the sand). It also comes in olive, burgundy and charcoal in sizes S – XL, and is bump-friendly for all you moms-to-be. Most of their clothes are, actually, which is one of my favorite things about the boutique. I fell in love with Daisy’s dress first, then found one for me that coordinated. 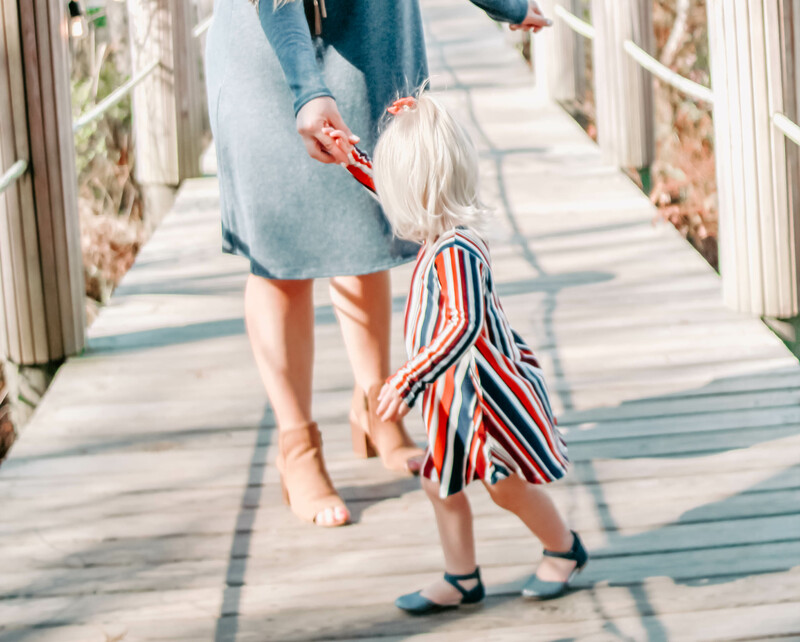 I usually dress her in pinks and bright colors, but I just love the muted colors and the stripes on the swing dress – it feels very 60s Twiggy to me! You can find it here on sale for $18. Be sure to subscribe to their emails and check the top of the website before you place your order – they always have great sales, and shipping is always fast and free! Speaking of subscribing, don’t forget to subscribe to my blog so you don’t miss more Daisy birthday and mommy-and-me style coming up. Just enter your email in the bar to the right :). Thanks for stopping by! My dress was gifted to me by PinkBlush in exchange for this post. Thank you, PinkBlush! My dress was gifted to me, courtesy of PinkBlush, in exchange for this post.